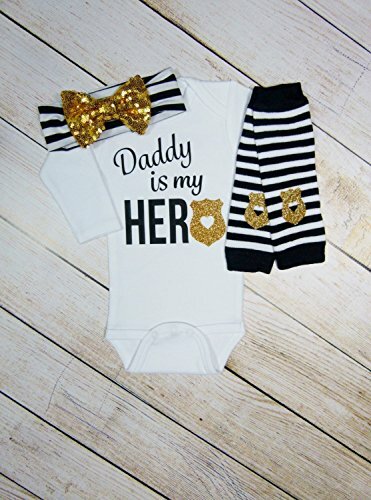 This is the the perfect gift for the police officer hero in her family. What better way for her to let everyone know they are her hero and do it in style! You have the choice to customize it to say Daddy, Mommy, Grandpa, Grandma, Uncle or Auntie. Headband: The headband is made of soft stretchy cotton headband with a 4" sequin bow and will be made to the size chosen for the bodysuit or tee shirt. Leg Warmers: The leg warmers have a gold glitter badge heat pressed on them. The leg warmers are available in both newborn or regular (3 months to children) sizes. Newborn size will be sent if newborn/0-3 bodysuit with leg warmers is chosen. If you have any questions about this product by Mama Bijou, contact us by completing and submitting the form below. If you are looking for a specif part number, please include it with your message.